Selling partner SVOD services inside The Roku Channel is a good move for Roku. It could also work out well for SVOD providers that chose to participate. However, Roku has an opportunity to make SVOD providers far prefer their platform over Amazon if it chooses to. Roku announced on Wednesday that it would begin selling subscriptions to partner SVOD services through The Roku Channel. Users will be able to browse all the content available in each service, try the service out in a free-trial period, and sign-up with one-click. They can also manage all their services in one place. Services available at launch later this month include Showtime, Starz, EPIX, and CuriosityStream. Market-leading services such as Netflix, Hulu, and HBO Now will not be available. Roku has been working hard to reinvent its business, shifting focus to its platform business (services and ads) and away from hardware sales. Selling SVOD services inside The Roku Channel will help accelerate the transition as it helps the company in several ways. Charging SVOD providers for billing, promotion, and marketing services will boost platform business revenues. Those opting to subscribe through the Roku Channel will increasingly view it as a primary hub for their online viewing. As they spend more time with the service, Roku active users will watch more free-ad-supported content resulting in increased ad revenues. Providing access to premium services through the Roku app on connected devices will help the company plug a big hole in its strategy. Until now, Roku has only delivered content to the television. Competitors like Apple and, to a lesser extent, Amazon are much stronger in mobile delivery. For Roku to truly break free of the hardware business, it must be able to deliver to all a user’s screens. Though Roku can only offer a quarter of the reach that Amazon can deliver, Roku may be able to do an even better job at getting consumers to sign up. The company reports the average active user spends nearly three hours a day streaming content. Data from comScore says that the average wireless streaming user in 2017 watched less than 11 hours per month (about 20 minutes per day) through Amazon Prime Video. As well, free content is already proving to be a big attraction to Roku users. 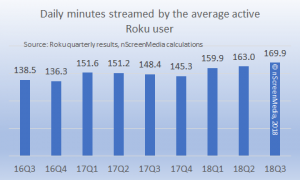 Since its launch in early 2018, The Roku Channel has risen quickly to become the 5th most popular channel on Roku powered devices. With so many people coming for the free content, there will be ample opportunity to pitch them on the premium services. Moreover, SVOD providers can release some content to be viewed in The Roku Channel free-ad-supported to help generate interest in the premium service. To be a successful seller of SVOD services Roku must up its marketing game. Today, there are few opportunities in the interface to drive consumers to partner content. That will have to change. As well, it will need to emulate some of Amazon’s marketing techniques. For example, it can leverage search results to nudge users toward partner SVOD services. Unfortunately, success in selling SVOD services will further erode Roku’s reputation as a neutral platform for content providers. Increasingly, it looks like a pay-to-play platform, like Amazon and Apple. Neutrality has been a key factor in the success of the Roku platform. It has helped make the number of services available on Roku far higher than any competitor. Moreover, the large number of services available has, in turn, helped drive sales of Roku devices. That said, there is an opportunity for Roku to make SVOD partners prefer its platform to Amazon Channels. SVOD providers tell nScreenMedia that Amazon provides little data to partners on the performance of their content. As well, there are few branding opportunities inside the Amazon Channel’s experience for service providers. Fix those problems while delivering the subscribers and success could be all but guaranteed. The decision to start selling partner SVOD subscriptions through The Roku Channel is a good one for Roku and its potential partners. Roku also has an opportunity to best Amazon by correcting some of the major annoyances Amazon Channels partners have with the platform.